A new GTI/HD Revolution scanner. New reconstruction techniques provide 128 slice imaging against the traditional 64 slice. A new General X Ray Unit. A new Catheterisation Laboratory (Cath Lab). An upgrade of our Cardiac MRI software. 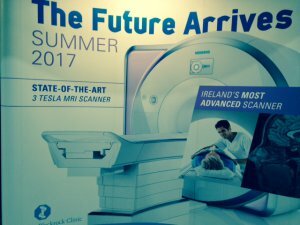 The imminent installation of a new 3Tesla MRI scanner. Patients require appointments for all radiology services with the exception of general x-ray which is a walk in service. To arrange a test or a specialist scan please call: 1800 300 200 or fax: 01 206 4368.